Among today's basic parameters in designing, creation, and promotion of a new product is the "sustainability" of the product and especially of its packaging. This is a prerequisite of the powerful retail chains which dominate the market of food, beverage, and other fast moving products. Retail trade executives tend to believe that the "sustainable" or "green" claims on the label of a product are affecting the choice of the average customer. Many studies though, indicate that price, quality, accessibility, or efficiency of a product and its packaging are equally or more important decision parameters. However, the "protection of the environment" remains the number one promotional tool. The "sustainability" trend stems from the pressure exerted by various citizen groups on the state and local administrators, and on trade and industry as well. It is of course a very popular subject in the mass media. However, trade and industry at large, soon realized that "sustainability" could turn from a threat into a positive image maker. Every national or international trade and professional association has now a committee promoting "sustainable" production and consumption. A recent example is the "European Food Sustainable Consumption and Production (SCP) Roundtable", launched in May 2009. The founding participants are CIAA (Confederation of Food and Drink Industries), COPA (Agri-cooperatives), EFMA (Fertilizer Manufacturers), EUROCOOP (Consumer Cooperatives), EUROPEN (Organization for Packaging and the Environment), FEFAC (Feed Manufacturers' Federation), IFAH (Federation for Animal Health), and PRO EUROPE (Packaging Recovery Organisation). Before proceeding to remove quotation marks from "sustainable", I would like to remind the reader of the definition of "sustainability"; a term coined by the UN Brundtland Commission in 1987: "Sustainable development is the development which meets the needs of the present without compromising the ability of future generations to meet their own needs". A more recent definition is: "Sustainable consumption and production (SCP), is the reduction of resource use while at the same time increasing economic and social well-being". It can be seen that sustainability is not limited to environment, but has two other equally important parameters: the economic and the social. We all agree that there is a very long way between the vision for sustainability and its realization, but at least it is a good cause to direct our efforts. Moreover, there is a wide open area of research and innovation, and the packaging industry should employ its creativity towards this direction: Saving energy and raw materials and minimising waste, without jeopardizing the primary role and purpose of packaging. However, the packaging industry alone is far from achieving the goal of sustainability. It is interesting to see the well known Brezet's model of the four levels of eco-design innovation (Figure1). Level 1 can be achieved in a short time (5-10 years), but its effect is minimal. In the other side, Level 4 is much more effective, but it might need a much longer time to be achieved (1-2 generations or more). To illustrate the four levels I will give you examples from the area of cloth washing. Level 1. Product improvement: The improvement of existing products with regards to pollution prevention and environmental care: Designing lighter weight bottles and cartons for detergents. Level 2. Product redesign: The product concept stays the same, but parts of the product are developed further or replaced by others: Formulate concentrated solutions requiring much smaller and lighter bottles. Level 3. Function innovation: Involves changing the way the cloth washing function is fulfilled: Use cold wash detergent formulations with tremendous energy savings. Level 4. System innovation: New products and services requiring changes in the related infrastructure and organisations: Replace home washing machines by an industrial washing system. Figure1. 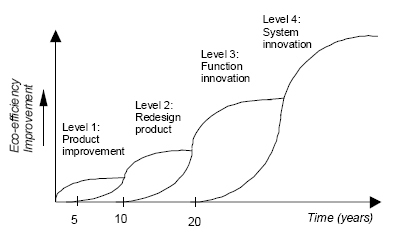 Brezet's model of the four levels of eco-design innovation: A long way to sustainability. The basic requirement for efficient eco-designing is the existence of benchmarks and evaluation tools which would show us whether we move to the right direction. The development of such tools started 40 years ago as Life Cycle Inventories for products or systems which were followed by Life Cycle Assessment tools. The term LCA today is synonymous to the term Environmental LCA. But the road to sustainability requires two more parallel assessments of a product-system or any other project, throughout its life: A Social Lifecycle Assessment, and An Economic Lifecycle Assessment. Many international organizations (including UN and EU) are working on the creation of reliable systems, but everything is in an early poorly developed stage. In this article we will be involved with the Environmental LCA only. LCA is the most reliable evaluation tool today, provided that we are well aware of its limitations, and the possible pitfalls when employing it. I would like to identify some of them, taking examples from LCA studies related to packaging. LCA on what? Life Cycle Assessment is a time consuming and tedious work. To get some meaningful results out of it we must employ LCA not to an isolated item (e.g. a milk container), but to the product system in which this item functions (e.g. production and consumption of milk). Functional unit. In order to have comparable results between products of different materials and sizes we must choose a functional unit not related to the material or the size, but to the common function in the system: Thus, if we want to compare the various ways to carry our shopping from the super market to our home, a suitable functional unit would be the volume of merchandise corresponding to an average family's shopping activity (In European countries this is about 9000 litres per year). Or if we want to compare the various coffee packagings, proper functional unit will be "a cup of coffee". System boundaries. Choice of system boundaries can turn the comparison between two products towards the one direction or the opposite. Differentiation in system boundaries resulted in contradictory results in many parallel LCA studies: e.g. German vs. Suisse on one-way or multi-trip PET bottles; German vs. Italian on one way fruit and vegetable carton crates vs. returnable multi trip plastic crates; Italian vs. Finish on virgin vs. recycled paper pulp, etc. These examples remind us that LCA are sometimes used as alibis to support preconceived political decisions or local interests. Data collection. The most important step in a LCA is the inventory on which the assessment is based. Data from different sources, especially related to regional effects, must be considered carefully before being applied. The problem becomes more difficult with the use of readily available software tools (like for example SimaPro7, GaBi4 etc). They make it easier to conduct an LCA, but it is not completely clear how the data were manipulated. The numerous underlying assumptions that were applied during data collection are not typically revealed in most pre-packaged data programs. Ultimately, the user must rely on the reputation of the vendor for assurance on the quality of the data and the methods used to collect them. It is amazing that the choice of a LCA tool by most people today is based on "how efficient its software is" .The environmental data on which the tool is based is of secondary importance. Environmental impact categories. There are more than 50 environmental impact categories which have be used in LCA. Out of them less than 10 are of common use. The choice of which categories will be employed is critical for the outcome of an inventory. A typical example related to a local problem is water availability. The popular LCA inventories developed in Holland or Switzerland are strongly involved with water pollution parameters. However they consider the water resources unlimited. But for someone who would be involved in cotton production in Greece, a water availability impact category should be critical. Always look who has commissioned the LCA. Have always available for quick reference ISO 14040, 14044, 14047, 14048. Read the critical reviews by the expert and by the panel of interested parties (required by ISO 14040, Section 7). These must accompany every LCA. Try to relate the system boundaries and the environmental categories selected with the interests of the party who has commissioned the LCA. Consumers, companies' decision makers, designers, journalists, legislators amongst others, are demanding information about the environmental implication of products and services. The approaches that come closer to the "real picture" are the Life Cycle Assessments. However, there is a widespread need to simplify the result by unifying all the unrelated parameters into a single score indicating that product A is greener than product B. Answering to this demand, several academic groups or commercial companies have devised single indicators for scoring the environmental performance of a product or its packaging. Examples of such indicators are: Environmental Sustainability Index (ESI), Eco-Indicator 99, EDIP2003, EPS 2000d, IMPACT 2002+, Swiss Eco-points, Eco-factors, PEI. The most widely discussed and criticized indicator is of course the Wal-Mart scorecard. Something expected, considering the burden has caused to Wal-Mart's suppliers around the world. I don't believe that the scorecard will lead to any serious environmental improvement, but it is definitely a powerful marketing tool for the company (as admitted several times by Wal-Mart's executives). To create a single environmental indicator or a scorecard one has to combine the results of various environmental categories, expressed in various units (Figure 2). The estimation of the contribution of each parameter to the total environmental burden (weighting factor) is based on personal opinions. For example the estimation of weighting factors for Eco-indicator 99 was based on the opinions of several Swiss panellists. Similarly, the weighting factors for the nine parameters of the Wal-Mart packaging score card were set after "consultation with leaders in the global packaging industry". But these methods do not lead to objective facts. There is no direct line linking an environmental assessment and a policy decision- making. In a decision making process are involved social, economic and regional parameters, and the ever present "public opinion". This is especially true when there are not decisive differences between the environmental parameters of alternatives under study. LCA can be used as alibis to support preconceived political decisions or local interests or, of course company interests. The environmental burden due to packaging materials, as constituents participating in product-systems, is normally very small. And the differences among the various packaging alternatives do not change notably the values of the environmental parameters in the LCA of the product-system. Take the footprint of milk for example: I have collected and compared values from several milk LCA, in which the total CO2 footprint values vary between 1500-2000 gCO2 equivalents/litre of milk. The pronounced variations (25%) are mainly due to differences in animal growing and farming conditions. The contribution of packaging materials (any packaging materials) is 100-150 gCO2 eq/l. This means that the best packaging improvement claim is less that 2.5%. Nice savings... but we should be a little more prudent and low keyed in our sustainability claims.